Janeway is the best Star Trek Captain. I will fight you on that. I mean no disrespect to Jean-Luc Picard, who remains one of my all-time favourite fictional human beings, but I don’t believe he could have handled the ongoing chaos of the Delta Quadrant with a fraction of Janeway’s unflappable chutzpah. Since Voyager’s original series run (1995-2001) unhappily coincided with my ill-advised teenage attempts to ditch sci-fi in pursuit of being “cool”, I revisited and finally finished the series a scant 3 years ago. Heavily pregnant during a massive heat wave, I watched in awe and increasing fascination at the courage, vigor, and poise with which Mulgrew portrayed Star Trek’s first female captain. If you, like me, are drawn to Born with Teeth because of a suspicious curiosity that Mulgrew harnesses a similar energy to her characters, you will not be disappointed. Star Trek fans will see reflections of Janeway’s courage and leadership; Orange is the New Black fans will find layers of Red’s matter-of-factness and vulnerability. However, overall, Mulgrew’s voice is definitively and uniquely her own. 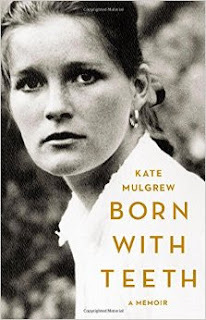 Her memoir gives the impression of one who is supremely confident in her identity and goals; while her memoir is frequently pre-occupied with questioning (and at times, tenderly regretting) her choices, Mulgrew never seems to doubt who she is. Her voice remains unwavering through every joy and pain. And what pain there is! Mulgrew has been no stranger to hardship in her life, and I was frequently moved to tears in the course of reading. Early on in the book, she reminisces of her first acting mentor, Stella Adler’s advice about pain in theatre: “use it.” That simple mantra is carried through Mulgrew’s entire 40-plus year career. In particular, her decision at 22 to give up her daughter for adoption haunts her throughout her life and work. Mulgrew’s regret over the adoption forms the book’s emotional center; like her life’s other heartbreaks, it is addressed directly, without shying away from the hard truths. While Born with Teeth is rife with anecdotes from every phase of Mulgrew’s career, plenty of mystery remains after the book is closed. As a Trekkie, I chuckled the most at her Voyager experiences, in particular the tale of her disastrous first audition, and her description of actor Robert Beltran’s aura as halfway “between come hither and get lost.” Mostly, she prioritizes personal experiences over professional ones, and aside from those tragedies that define her life, Mulgrew keeps her emphasis firmly on the positive. Falling in love is lingered over, while break-ups are blips, practically footnotes. People whom she loves and admires are gushed over, while others are basically left out. Also missing are any musings on her life after Voyager, so Orange is the New Black fans may be disappointed. Personally, I’m hoping for a sequel. If you’re in the mood for more well-written actress memoirs, I can’t help but recommend Bossypants by Tina Fey. Though Fey is a comedy actress and writer while Mulgrew’s career is more dramatic and theatre-focused, both women are deservedly renowned for their confidence, perseverance, and unique voices. Where Mulgrew is poised, Fey is self-deprecating, but both women display a level of honesty and forth-rightness rarely seen in life or show-business.